Speaking about Wikipedia’s blackout and further support to abolish the controversial SOPA and PIPA bills, Jimmy Wales went on record at the DLD Conference in Munich to call out Motion Picture Association of America (MPAA) chief executive Christopher Dodd, saying that he should be fired by the organisation that he represents. Wales also referenced Dodd’s interview with Fox News where he said that politicians who failed to back anti-piracy legislation could see Hollywood withdraw their funding. Recognising that whilst the majority of ant-SOPA campaigners are against piracy, Wales says that the “other side” is getting away with making claims that companies like Google are pirates because they serve links to copyrighted content, ensuring that a comprehensive discussion cannot be had about the issues. If there are serious criminal organisations engaging in large-scale piracy, then let’s start to deal with that. But let’s deal with that in ways that don’t involve censoring the Internet, that don’t involve ridiculous technologically incompentent ideas. Let’s have a serious conversation about what we can do about some of these problems. I think we have that opportunity now, and I think we should take it. At the beginning on the panel, Pavel Durov — creator of Russian social network Vkontakte — pledged his support to Wikipedia, noting how it works to help educate people and how it’s not fair that the site has to solicit contributions over a number of months. 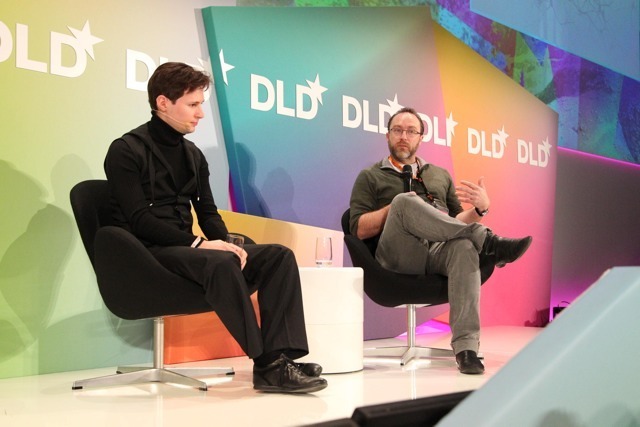 Durov announced live on stage that he would personally donate $1 million dollars to the online encyclopaedia, marking one of the largest contributions the website has received since it launched. Last year, we interviewed Wales at an Internet Week Europe event in London, where the Wikipedia founder talked about the donations process on the website. Google holds the record for the highest contribution, donating $2 million, with a number of other investors making $500,000 pledges. Wales says he is sympathetic to companies that spend $100 million dollars making a movie, only for it to leak on the Internet before it launched, but highlights the problems with being able to view content he has already bought on different mediums that just isn’t available where he lives. “It is easy for us on our side to say [the MPAA] was against the VCR, cassette tapes and have been against these things and made lots of money, so now you are against the Internet and we are just going to ignore you because you were wrong before. That is a tempting approach but we also have to say they do face real serious problems. If we don’t listen to their real problems, they won’t listen to our real problems. There are solutions here that aren’t all that complicated.